Are surfboards and wetsuits provided? Approximately 2 hours which includes wetsuit fitting, beach/ ocean safety talk, beach lessons, and water time. Yes. It is recommended that your participant has taken swim lessons. All of our instructors are CPR certified. What if surf conditions are not safe? Our priority is the safety of our participants. If the conditions are not safe we supplement with beach activities. How early can we drop off our participants? No earlier than 15 minutes prior. We are still setting up and cannot supervise the participants. 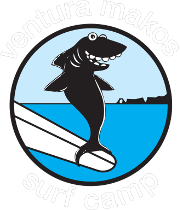 What are surf camp hours? What if I’m late to drop off? In an effort to keep the camp running efficiently, we do not allow arrivals after 9:30am. How early can I pick up? If the participant has somewhere they need to be, please tell the instructors at check-in when you will be picking your participant up. Otherwise we ask that you do not pick up before 2:45 pm, as we like them to participate in the camp chant & clean up. What if I’m late to pick up? We allow a grace period of 10 minutes. After that we charge $5.00 every 5 minutes. Are there makeup days if I miss a day? If your participant is sick please call or email us before the start of camp. We will schedule a makeup day. There are no makeup days for no shows. We do not recommend it but if you choose to stay, please stay where the child cannot easily see you. We want the participants to fully participate in the camp and they perform better if they know you are not around. The participant needs to adhere to camp rules & stay in the camp boundaries. If the participant sees you and wanders off, it is hard to know who is watching them. For a full refund, cancellations need to be made 1 week prior to the start of camp. In order to adhere to our safety ratio, we do not allow drop-ins if we have reached our safety ratio. If it allows, we charge $100 for the day. Please sign up at least 24 hours in advance (registration closes 24 hours prior. What do we bring to camp? Sunscreen, towel, water, snacks, other sun protection, warm change of clothes, lunch. Fridays we provide pizza and soda. If your participant has special dietary needs, please provide their own lunch.